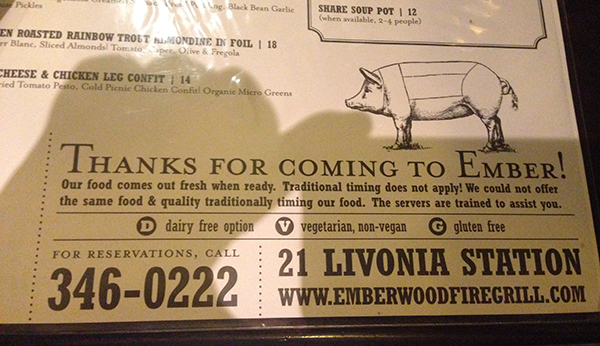 I have a friend at work named Ted, who, in the event the topic of food, dining or restaurants comes up, mentions Ember Woodfire Grill. In fact he feels it is the best restaurant in Rochester. Typically I jump at the chance to try a recommendation, but for one reason or the other, we never got around to trying it. For Aaron's birthday, I thought "What better spot than the best food in Rochester?" Actually it's in Livonai, about half an hour south of Rochester. They have a very cool approach to food at Ember. The food comes out when it's ready, not in the traditional appetizer and main course sort of way. And they highly encourage sharing. That is right up my alley. We started with seared tuna on fried wonton and sweet potato egg rolls. Each dish has special touches - unique sauces and garnishes. But they aren't overdone. We went on to get the mac and cheese and the beef pot pie. We loved each bite. Besides that the environment at Ember is cozy and comfortable without being pretentious. All Ted said was "I told you so."